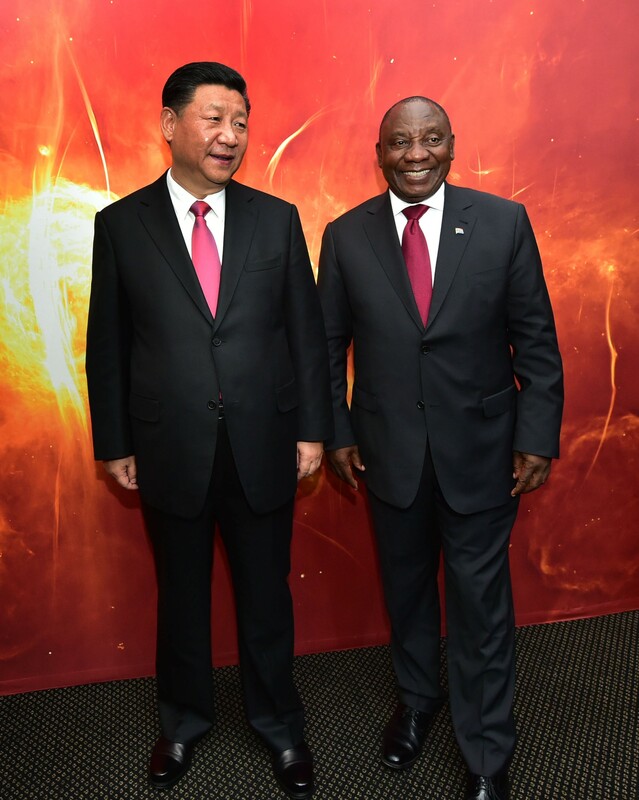 Radio astronomy in South Africa featured prominently when the President of the Republic of South Africa, His Excellency Mr Cyril Ramaphosa, hosted the President of the People’s Republic of China, His Excellency Mr Xi Jinping, on a State Visit to South Africa. The picture was taken in front of the image generated using MeerKAT revealing the galactic centre at radio frequencies between 900 MHz and 1,670 MHz. The Department of Science and Technology (DST) highlighted South Africa’s achievements in radio astronomy in a joint China-South Africa exhibition at the Council for Scientific and Industrial Research (CSIR) in Pretoria on Tuesday. The exhibition with the title The Achievements of South Africa-China Science, Technology and Innovation Cooperation, showcased the achievements of China and South Africa in science, technology and innovation (STI) as well as the achievements of China-South Africa cooperation in STI, was hosted by DST in support of President Xi’s State Visit. The State Visit takes place within the context of strengthening strategic and historic political, economic, social and international cooperation partnership between China and South Africa. China has been South Africa’s largest trade partner over the last decade, with total trade between the two countries growing from R118 billion in 2009 to R271 billion in 2013. China and South Africa are currently world leaders in the field of radio astronomy. The National Astronomical Observatories of China (NAOC) is home to the Five-hundred-meter Aperture Spherical radio Telescope (FAST), the world’s largest single dish radio telescope; while the South African Radio Astronomy Observatory (SARAO) unveiled its MeerKAT radio telescope on 13 July 2018, now the world’s most powerful telescope of its kind. 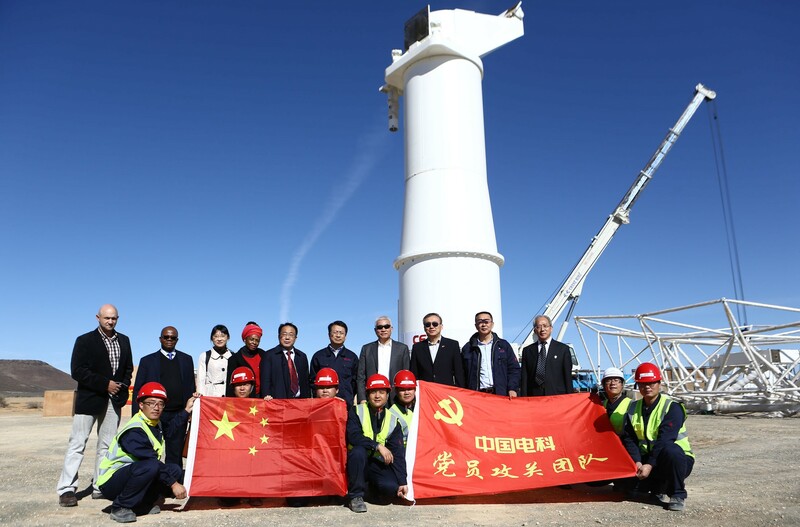 China and South Africa are also a Member Country and Host Country, respectively, of the Square Kilometre Array (SKA) Oganisation, an international collaboration between 12 countries to build the world’s largest and most sensitive radio telescope, the Square Kilometre Array, due for completion in the 2020s. The SKA is to be constructed in South Africa and Australia; with a later expansion of both sites as well as into other African countries. 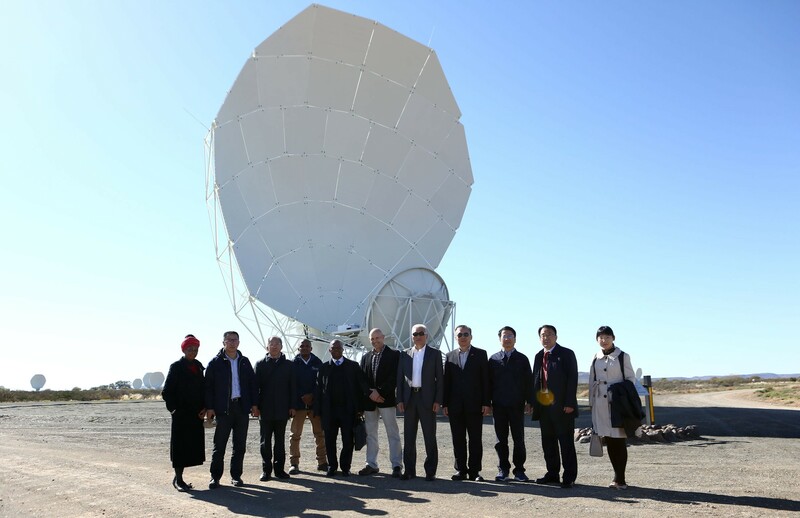 China’s 54th Institute of China Electronics Technology Group Corporation (CETC54) has been leading the international effort to design the SKA dish with partners from Canada, France, Germany, Italy, Sweden, the UK and South Africa. A prototype funded by the German Max Planck Society arrived on the South African SKA site in the Northern Cape last week. China and South Africa are both looking to advance STI and support the Fourth Industrial Revolution in their respective countries by exploring areas of cooperation under their current science and technology agreement. The two countries are due to sign an action plan that will include joint research programmes and exchange programmes to share knowledge and skills in various fields. President Xi’s State Visit to South Africa comes ahead of the 2018 BRICS Summit to be held in Johannesburg, Gauteng from 25-27 July 2018. The annual summit brings together leaders from Brazil, Russia, India, China and South Africa (BRICS), a grouping of the world’s leading emerging economies. Discussions at the 2018 BRICS Summit will represent cooperation between members at the highest diplomatic level on three levels, namely formal diplomatic engagement between the national governments; engagement through government-affiliated institutions; and society and “people-to-people” engagement. The South African Radio Astronomy Observatory (SARAO) spearheads South Africa’s activities in the Square Kilometre Array Radio Telescope, commonly known as the SKA, in engineering, science and construction. SARAO is a National Facility managed by the National Research Foundation and incorporates radio astronomy instruments and programmes such as the MeerKAT and KAT-7 telescopes in the Karoo, the Hartebeesthoek Radio Astronomy Observatory (HartRAO) in Gauteng, the African Very Long Baseline Interferometry (AVN) programme in nine African countries as well as the associated human capital development and commercialisation endeavours. MeerKAT is a South African project, a precursor to the larger international Square Kilometre Array (SKA). It is managed by the South African Radio Astronomy Observatory (SARAO), where most of the specialised hardware and associated software was designed and built, in cooperation with industrial partners. MeerKAT consists of 64 antennas (or dishes), each 13.5 metres in diametre, located on baselines (distances between antenna pairs) of up to 8 km. The dishes are of a highly efficient design with up to four cryogenic receiver systems operating in different bands of the radio spectrum. The first installed set of receivers operates between frequencies of 900 MHz and 1670 MHz. The vast amounts of data from the 64 dishes (up to 275 Gbytes per second) are processed in real time by a “correlator”, followed by a “science processor”, both purpose-built. After further offline analysis, images of the radio sky are generated. Eventually, MeerKAT will be incorporated into Phase 1 of the SKA-MID telescope.